SR A2 size Natural Lokta paper for inkjet and laser printers (pack of 10 sheets). Natural lokta paper is a creamy, pale yellow or butter-milk colour similar to vellum or parchment, which is difficult to photograph... If in doubt about the colour, order our Natural Lokta swatch pack or the Natural Lokta sample pack. 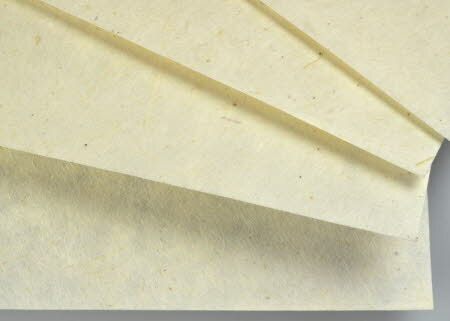 SRA2 paper is 640 mm by 450 mm and larger than standard A2 paper as it is intended as untrimmed paper for printers. If you are asking a printer to print paper invitations, then this is the paper you are looking for. SRA2 paper is about 2.3 times the size of A3 paper. The paper has a smooth calendared top surface and a slightly less smooth reverse surface. We suggest that you use this paper one sided in laser printers but you can easily use it for two-sided printing in inkjet printers. This is a natural product and the colours are approximate. They vary between batches and may be displayed differently on different computer monitors.